Gaming these days is truly a ubiquitous form of entertainment, with people of all age groups proudly calling themselves gamers. While gaming is a great way to relax and extract yourself from reality, your eyes are usually the first to remind you that you’re not in fact a superhero as they become strained, blurry, and dry. This is mother nature’s way of giving you a heads up that something is amiss. According to scientists, prolonged exposure to computer and smartphone devices puts your eyes at risk of macular degeneration and even blindness. Much of the negative effects of starring at computer screens for too long can be attributed to the harmful blue light that these devices emit. Computer gaming glasses that filter out this spectrum of light is an effective way to shield your eyes from early macular degeneration, according to optometrists. Other important preventative measures include reducing on screen time, turning off your devices an hour or so before bed time, and resting your eyes frequently. Now that you just how critical gaming glasses can be for protecting your eyes, read on for my detailed reviews of the best gaming glasses you should get to protect your eyes and your family’s. J + S gaming glasses gets our nod for the best overall gaming glasses. Most computer gaming glasses that block out blue light are heavily tinted, with high color distortions that make the life of a graphic designer or even gamer harder. 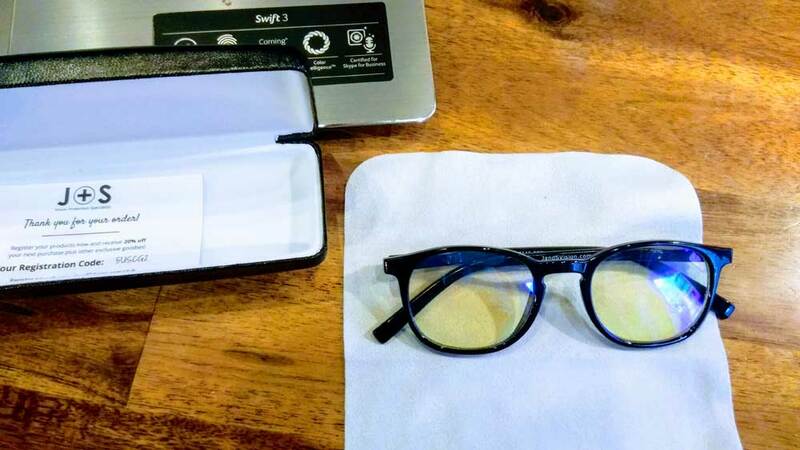 The J + S gaming glasses takes this into consideration, filtering out 90% of the invisible high energy blue light that are harmful to the human eye while allowing 70% of low-energy blue light to come in. This means you will still be able to see blue on your screen, unlike many blue light blocking glasses that just block the entire spectrum of blue indiscriminately. While beneficial in small amounts, high energy blue UV light can cause macular degeneration from prolonged exposure, not to mention throwing your circadian rhythm out of sync when exposed to at night. Users have lauded the ability of the J + S glasses to block most UV light while reducing digital strain — few (if any) headaches and discomfort were observed. These J+S gaming glasses have a low-color distortion lens that aren’t too tinted, instead balancing viewing quality and eye protection. About 70% of low-energy blue light is let in to reduce the color distortion. Everything looked crystal sharp when I put on the J + S gaming glasses. The colors on my screen and even surrounding became more vivid. Being able to see everything clearer was a great side effect of the glasses. A slight yellow tint made my entire surrounding warmer, especially on a cloudy day. These specs just might even have some therapeutic effect when you’re feeling down. The J+S gaming glasses are well made and designed to handle different face sizes automatically. The spring-loaded hinges expands and contracts as you put them on, a nifty feature that reduces much of the worry of finding perfectly-sized frames. The unisex color and shape makes these glasses even more versatile. Some people have noted that the bridge is a little wide, with the frame sliding down their noses over time. There is a 30-day money-back guarantee and a one-year warranty if you have issues with them. Some people complained of the easily-smudged lens, but given the great blue light protection and affordable price, this is a great purchase. If you’re a serious gamer or computer user that suffers from eye fatigue, blurred vision, polyopia, or dry eyes, consider this: The Gunnar Optiks computer glasses are the only patented computer eyewear recommended by doctors. 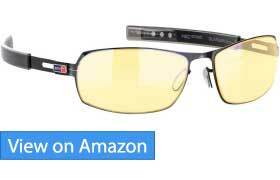 It’s clear that a LOT of people have noticed a big difference with eye relief since using the Gunnar Optiks glasses. The Gunnar Optiks blocks high energy blue light, UV rays, and glare like most computer glasses. 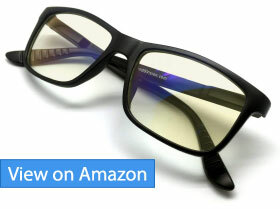 In addition however, it also comes with a slight amount of magnification to reduce chronic eye strain. 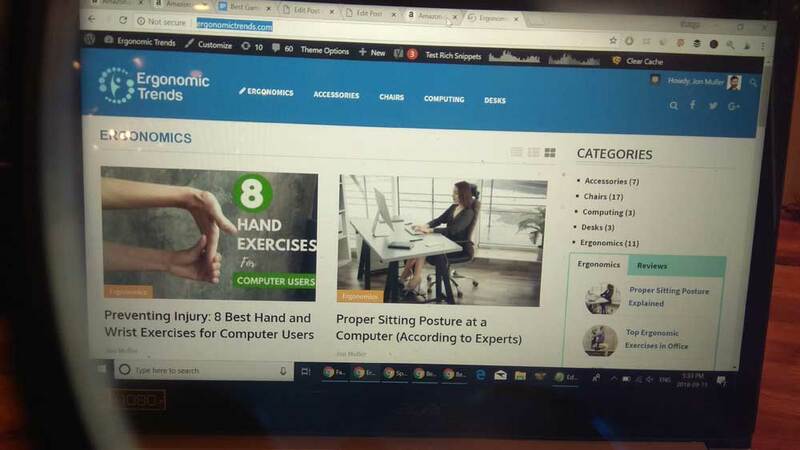 These days the screen resolution on computer monitors and laptop screens are getting higher and higher, which means objects are getting smaller and smaller on the screen. If you’re like me and find yourself having to lean forward sometimes to see small details on your screen, a slight magnification can really help relax your eyes and reduce strain. For detailed oriented games like strategy or role playing games, the Gunnar Optiks can really help you game with less straining. Everything spells premium with the Gunnar Optiks computer glasses, which is reflected in the higher price. Firstly, unlike most computer gaming glasses that are made of plastic, the frame on the Gunnar is made from a high-tensile steel, which is extremely lightweight (25 grams including the lens) and durable. For kids and teenagers that are prone to breaking things, the Gunnar Optiks is arguably a better choice over cheaper plastic frames. I also love the silicone nose pads on these frames which help them stay on your face without slipping better. The Gunnar MLG Phantom comes with a generous one-year warranty. Unfortunately, the case is sold separately, as well as the games you may wish to play when wearing these frames. 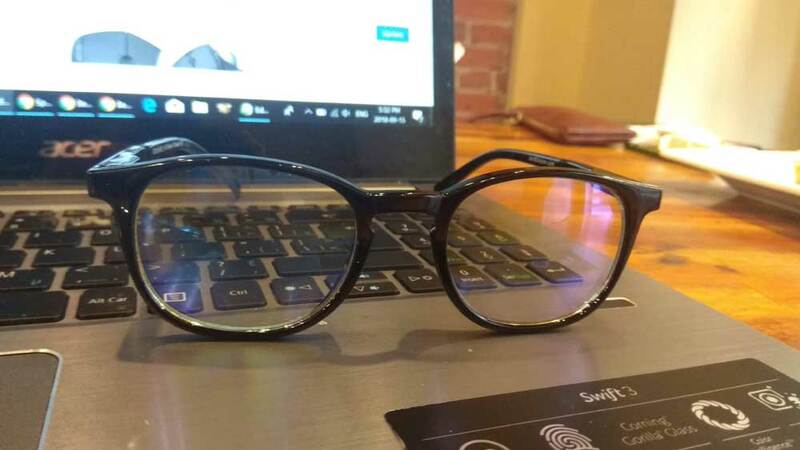 The Bukos Blue Light Blocking Glasses are certified by the US FDA for protecting your eyes against electronic devices, which is a nice reassurance. These glasses help guard against the risk of age-related macular degeneration induced by extended periods of exposure to UV light from digital screens. The lenses can block up to 99% of UV light (10–400 nm) and 40% of blue light (450–500 nm). Most computer glasses have pretty weak UV light protection, if at all, so it’s good to see the Bukos stepping up in this regard. 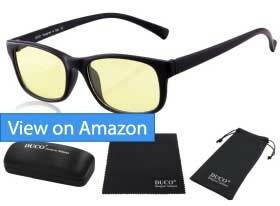 Besides using them for working in front of a computer or gaming, you can also wear the Bukos Computer glasses when sleeping to mitigate the effects of insomnia and other ailments. Rated as a Class 1 medical device, they help with everything from insomnia, difficultly staying asleep, to even ADHD related sleep problems. Many users have reported better quality snoozes with these on. The black unisex frames on the Bukos Computer Glasses can accommodate varying head sizes and shapes thanks to the durable TR90 plastic frame that bends without breaking. They are also reinforced by a screw on the inner side of the temples. With little visible tint, these can pass off as normal glasses. 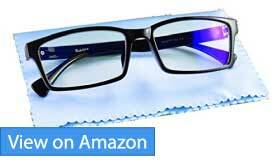 A complementary hard case and microfiber cleaning cloth comes standard with these glasses. Bukos provides a 30-day money-back guarantee and 90-day exchange period for defective or broken parts. 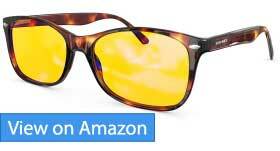 If you’re looking for a pair of computer glasses that block UV as well as helps with sleep, the Bukos is your best choice. If you’re a heavy gamer or computer user, there’s a good chance you wear prescription glasses already. If so, a regular pair of computer glasses simply won’t work for you, as very few go over another pair of glasses (without looking ridiculous even if that works). If that’s you, the Gameking Clip On Computer Glasses are what you need. Weighing just 8 grams and made of hardened scratch resistant materials, you can literally carry these clip-on lens in your pocket wherever you go, and attach them to your prescription lenses when you’re ready to get your game on. These anti-reflective lenses can block up to 60% of blue light, filtering out 85% of relatively harmful blue light while allowing 56% of less harmful blue light in. Note that a small amount of blue light is beneficial, as it can stimulate productivity and drive our circadian rhythm. Many people have reported a big decrease in digital eye strain, fatigue, and tension headaches since wearing these clip-on lens. Like the Bukos glasses, the GAMEKING clip-on glasses also seem to have a positive effect on your sleep when used an hour or so before bedtime. One user says it’s added about 30 minutes of better sleep every day since using the Gameking glasses. Now that’s worth the price of admission right there. The Gameking clip-on rimless glasses come with a hard case, soft pouch, and cleaning cloth, as well as a 30-day money-back guarantee and a lifetime breakage warranty. The product box is made from recycled materials and is 100% recyclable. In general computer glasses are a little different from sleeping glasses in that the former doesn’t block the full spectrum of blue light. This allows a certain amount of low energy, non harmful blue light to pass through so you can still see the color blue on your screen. Sleeping glasses on the other hand block blue light more indiscriminately so no level of blue light that are known to disrupt the production of melatonin (and hence your sleep) is allowed though. 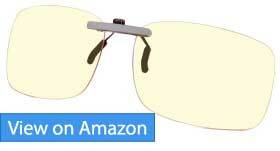 Sleeping glasses can usually be picked out by their amber tinted lenses, as opposed to the light yellow hue of less aggressive computer glasses. With that intro out of the way, Swanwick are computer glasses that double as excellent sleep glasses due to the high amount of blue light in general that it blocks. This why the lenses appear amber in tone. The manufacturer recommends using them 90 minutes before sleeping to notice a marked improvement in the quality and duration of sleep you get. Indeed, if you read the user testimonials, you’ll see how many people have extolled just how much the Sawnwick glasses have helped with their sleep. 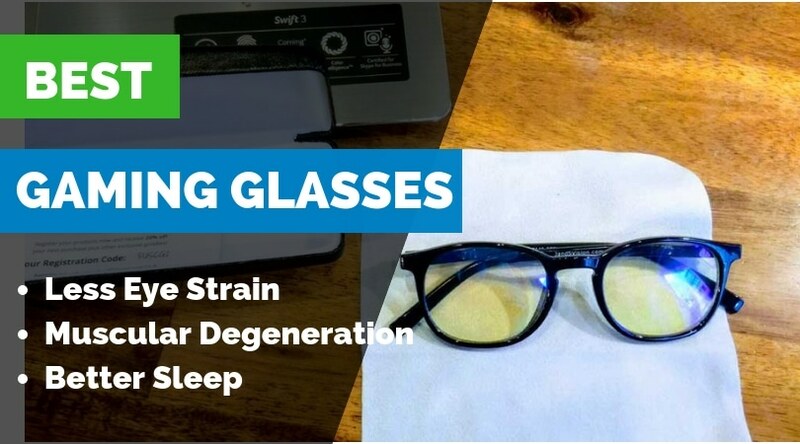 Many users are falling asleep faster at night, with longer and deeper sleep due to the total spectrum of bluelight that the Swanwick glasses block. So why shouldn’t everyone just purchase the Swanwick glasses over the other choices here then? Well, due to the aggressive blue light blockage, they don’t make the best glasses if color accuracy on the screen is important to you. Whether you’re a web designer, photographer, or just an avid viewer of the Smurfs cartoons, being able to see all shades of blue on your screen is important. In those cases the Swanwick glasses won’t be your best choice, Swanwick doesn’t recommend wearing these glasses while driving or operating machinery either. For the environmentally conscious, you’ll be happy to know that the frames on the Swanwick is made of acetate instead of petroleum based plastic. They are much more biodegradable than plastic, and more durable to boot. The Swanwick frames come in a choice of mixed brown or all black, with different sizes based on head size. There’s even a size for kids. 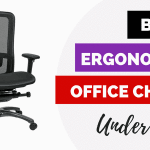 Springs in the hinges give these specs some extra flexibility. If preventing electronic devices from disrupting your sleep is your top priority, the Swanwick Computer Glasses should be your top choice. Very few computer glasses are as effective as the Swanwick in blocking against the entire spectrum of blue light that is known to disrupt melatonin production in your body, in turn a good night sleep. Amber tinted sleeping glasses have been scientifically verified to significantly improve sleep quality in patients. Due to the high amber hue though, I don’t recommend the Sawnwick gaming glasses if color accuracy is also an important consideration for you. You can have your cake and eat it too though, by buying a regular pair of Computer glasses such as the J+S glasses during the day, and 1 hour before bed time, switching over to the Swanwick glasses. Like the J+S glasses, the Duco full rim gaming glasses block 90% of incoming UV light, which can really help cut down on digital eye strain and harmful high energy blue light. Many people have observed a noticeable decrease in eye strain, fatigue, and dryness after wearing the Duco Glasses. 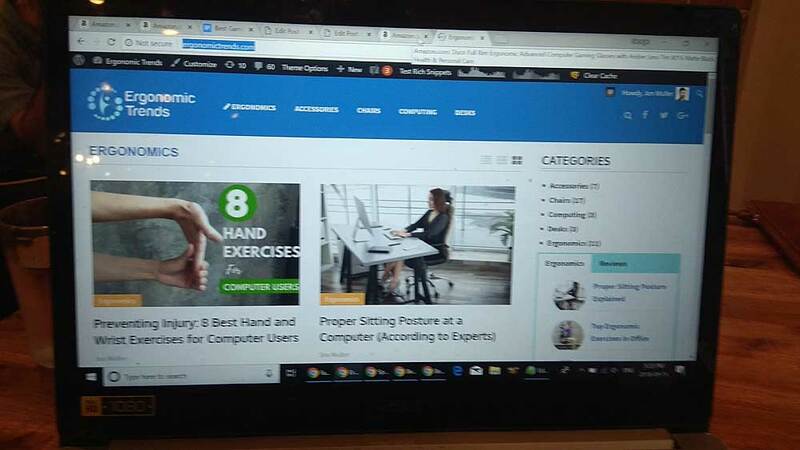 One user of the Duco credited the glasses with helping him be able to work and game in front of a computer again- his eyes used to burn, with no adjustments to the monitor colors helping. That’s the power of a good pair of gaming glasses. The Duco glasses frame should fit most people comfortably, as it uses a flexible and lightweight TR90 frame that are touted by Duco as “Rx Prescription Ready High Quality”. Apart from being sturdy and high quality, it also means you can bring it to an optometrist to have your prescription lens fitted. There are plastic protrusions on the bridge that function as nose pads. Indeed, at this price point, these are the best frames you’ll probably find on a pair of computer glasses. It even comes with a case, lens cloth, drawstring bag, and mini-screwdriver. According to Nielsen, the average adult American spends over 10 hours a day staring at some sort of digital screen. If you’re a gamer, that number is likely much higher. Whether you spend the bulk of that time staring at a computer screen, TV, or your smartphone, all of these devices emit what is called blue light. Blue light is everywhere, with the sun being the biggest source of blue light. We all know we shouldn’t directly stare at the sun, even for a fraction of a minute due to the harmful effects it has on our eyes at the cellular level. However, when we stare at electronic devices, we are essentially staring at a miniature version of the sun, and for hours on end each day. The duration of time plus proximity of our eyes we spent in front of these blue light emitting devices everyday is what can – and is – causing serious harms to our eyes. The natural light is made up of different colors which move at different wavelengths. The red light has a longer wavelength and less energy. Blue light has a much shorter wavelength and high energy. Blue light exposes your eyes to many short wavelength radiations, which are harmful to your eyes. As mentioned, the biggest source of blue light comes from the sun. Other sources of blue light include LED light, fluorescent light, computer monitors and flat screen LED televisions. Gamers are especially at risk of overexposure to blue light, due to the non stop staring at the screen without breaks in between. Macular Degeneration: The high energy of blue light can penetrate all the way to the very back of the eyes, or the retina, leading to the death of photoreceptor cells in the eye. Called macular degeneration, the process is irreversible, and can lead to blindness. Digital eyestrain: All of us have experienced this: after long hours of gaming, working, or simply checking your status updates on Facebook, our eyes feel dry, fatigued, or even irritated. This is called digital eyestrain, and according to experts is due to blue light in electronic devices that decrease contrast to our eyes. Digital eyestrain can also produce neck and back pain. Potential Cancer Links: Blue light from PC screens, smartphones, and outdoor LEDs have been linked to certain cancers such as breast and prostate cancer, according to an article in CNN. In men, those who are exposed to high levels of indoor artificial blue light had a 2.8x higher chance of developing prostate cancer, according to the alarming study. Disruption of Circadian Rhythm and Sleep: Blue light has been proven to disrupt your circadian rhythm, by suppressing melatonin production in your body. According to Harvard Medical, 6.5 hours of blue light exposure can shift circadian rhythm by up to 3 hours, making it much more difficult for you to fall asleep, and also degrading the quality of your sleep. It’s no wonder so many gamers are night owls while constantly feeling tired during the day time. What are the Benefits of Computer Gaming Glasses? Sharpens what you see by increasing contrast, giving you an experience similar to HD vision. Some gaming glasses such as the Gunnar Optiks computer glasses also add a slight magnification, letting you more easily see small objects on the computer screen. This leads to less fatigue and more relaxed eyes. Some gaming glasses also act as sleeping glasses, filtering out the entire spectrum of blue light that is known to disrupt melatonin production. Do you not need a prescription to purchase gaming glasses, and most are extremely affordable, especially for the potential benefits they provide. Are Gaming Glasses and Bluelight Blocking Sleeping Glasses the Same Thing? Most gaming glasses only block the high energy bluelight that can cause digital eye strain and macular degeneration. Their lenses consist of a light yellow hue designed to minimize color distortions on the screen, so you are still able to see the color “blue” on the screen. Dedicated sleeping Glasses on the other hand usually consist of amber/orange lenses that block the full spectrum of blue light coming into contact with your eyes, even less harmful blue light that can simply disrupt your sleep. Many of these glasses are made of polycarbonate ,which is the common material for gaming lenses. Are Gaming Glasses only for Gamers? Absolutely not! Gaming glasses are called as such because they are ideal for gamers that spend a lot of time in front of the computer or smartphone. These days however, even non gamers are glued to their screens, and can benefit immensely from a pair of gaming glasses that filter out the blue light that has been linked to everything from eye strains, dry eyes, to macular degeneration and even blindness over time. Gaming glasses are suitable as well for adults and children who spend a lot of time in front of a LED TV, which also generates a lot of blue light that can be harmful to their eyes or sleeping quality. What if I wear Prescription Glasses Already? If you wear prescription glasses, it’s not the end of the world. There are clip on gaming glasses such as GAMEKING clip-on glasses that will work with any existing prescription glasses that you wear.